Written by Andrea Morisette Grazzini. Posted on 23 Jun ’12. Filed under Citizens, Civic Science, Community, Constructivism, Democracy, Environment, Social Innovation, Social Organizations. Bookmark the Permalink. Post a Comment. Leave a Trackback URL. As it turns out, thriving social systems act a lot like healthy trees. Both “ends” of a tree—like human social systems—serve complementary roles as both “vessels” that contain growth producing materials, and “venues” or places where more growth can emerge from. Translated into social life, this means that both the tips — meaning the visible leaders in business, media, politics and community realms; and the roots — meaning the less visible networks of people whose work or lives aren’t as attention-getting: like employees, teachers, volunteers and home focused family members– contribute to, and indeed are all critical agents of a healthy common system. That is, when and if they are connected together by mutually-supportive systems. Think of the architecture of a tree. Featuring a visible, vertical trunk from which grows large branches that in turn support smaller branches and leaves. All are living, animate. And all also interact with inanimate variables such as weather, native habitat and ecological environment. Without all of which, there would be no tree. But we often forget what we don’t see: namely, the tree’s roots. Also without which there would be no tree! The deep, horizontally branched networks of roots keep the tree standing by structurally mirroring below ground what’s above ground. So, both visible vertical and hidden horizontal systems are interdependent, connected to each other by their shared trunk. And, indirectly to inanimate forces that directly impact the other. Above ground, wind-swept leaves capture and filter sun and rain. They eventually float to the ground, where they undergo entropic processing. As they die they turn into food or fertilizer for the tree that is absorbed back into the ground, and/or with seeds that germinate saplings. Below ground, meanwhile, roots branching through the soil capture moisture and minerals, recycling them through the trunk and back into the tree for nutrition. 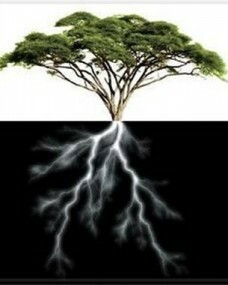 So, then, what serves as the metaphorical “trunk” that connects the”roots” to the”tips” of human social systems? Institutions, organizations, governments and public spaces that connect and unify the clearly visible leaders to equally as many or more invisible people, without whom leaders couldn’t build and grow social culture. Like a tree without roots, a social system not deeply connected with its roots won’t survive, thrive and nurture ongoing, future growth. This co-constructed infrastructure, thus, functions effectively only when all ends of the social ecology dialogically deliver their individually accessed, but interdependently enriched common resources. When human tips, roots and the trunk-like spaces bridge all together to understand and enable the capacities of all parts as equally vital, they’ll grow integrally stronger — and, in time, in natural synch. It is a model echoed in the themes of 2010 Nobel Prize winner in Economics, Elinor Ostrom’s common pool resources. Such biomimicry-inspired constructivist processes succeed by insuring that all thrive and together stay ‘ever green’ in sustained economic, social and, even spiritual ways. For more on these themes, take a look at Design in Nature: How the Constructal Law Governs Evolution in Biology, Physics, Technology, and Social Organization by Adrian Bejan Adrian and J. Peder Zane. Andrea Morisette Grazzini is a writer, consultant and participatory researcher. Her work has influenced numerous local, national and global conversations on cross-sector collaboration. She co-founded the tech-company Peoplenet Communications Corporation in 1993. And founded the cross-partisan initiative DynamicShift in 2009. After the failures of the societal organisational tree at Rio+20, why the Constructal law explains how the right to sustainable design & development should become a fundamental human right in the UN universal declaration. Suggested Implication: we violate a law of nature at our peril, from hubris, inevitably comes nemesis. If effect, stakeholders who violate physical laws are committing crimes against nature, against the biosphere and our societies that depend on and are integral to it. From this position, the only rational, ethical course is to draft and pass legislation to regulate and mitigate those violations. The right to sustainable development should therefore be a fundamental human right (like the right to uncensored information), and be enshrined in the UN universal declaration as such. Nigel is the designer of the iconic observation wheel proposal, the “中－Zhong-shaped” Hong Kong Spin and co-discoverer of the Asynsis principle-Constructal law – a new geometric, sustainable design law of nature: the two are linked by Leonardo Da Vinci’s Golden Ratio, otherwise known as the Divine Proportion. Great article, thank you for writing this. Just like natural systems, human organizations evolve to enhance flow access. I wrote an article about this called ‘Why Hierarchies are Natural, and Inevitable’. You can read it here: http://www.mindmedley.com/blog/why-hierarchies-are-natural-and-inevitable/.